The agreement adds the IRISS Polymer Infrared Windows and Delta T Alert to its dedicated product programme, a move that is said to not only strengthens TCAM’s core business but also offer its customers distinct practical and performance advantages. When HENKEL started to explore the best way to convey the merits of its latest LOCTITE structural bonding development, it set its sights on creating a demonstration that would really make industry take notice. 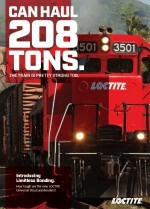 Henkel engineers decided to show the strength and durability of new and patented LOCTITE hybrid adhesive technology by designing a bonded coupler that would pull freight train wagons weighing 208 tons.